Before we get started – I am going to suggest that you add the spices in increments. I really wanted a gingery-carrot flavor so I was heavy handed with my ginger, but for those of you who are less inclined towards ginger, cumin, and mustard, you should add in small increments so that you can season accordingly. 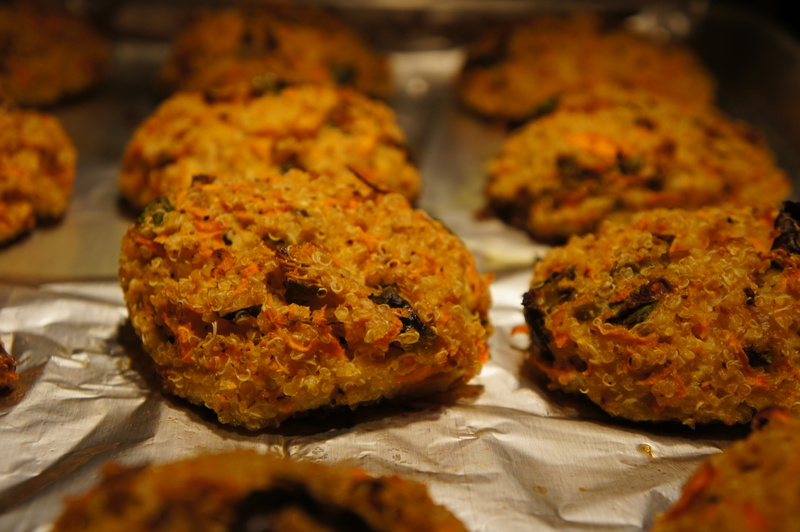 The result I got was a mildly spicy quinoa cake with a crispy exterior and squishy inside… so if you want even MORE ginger, go for it!!! Bring quinoa to a boil in 2 cups of water. Once the water comes to a rolling boil, lower the heat to low/medium and cover. Cook for 20 minutes, or until the quinoa has cooked through. Fluff with a fork and let it cool. Add the quinoa and stir until well combined. Slowly add your spices until you get the flavor profile you like. Keep in mind that the ginger will mellow significantly as you cook. Mix in whisked eggs until well combined. Drizzle olive oil on a cooke sheet. I used a foil covered sheet, but still found that I got a little sticking, so I recommend using a non-stick surface and plenty of oil. I don’t think parchment paper will work since it will absorb the moisture, but perhaps a silicone baking sheet, or an enamel pan would work. Let me know in the comments if you end up finding a better solution than tin foil! Bake at 400F for about 30-40 minutes, or until the bottoms have browned and the insides are cooked through. I drizzled a little extra olive oil at the 1/2 point. 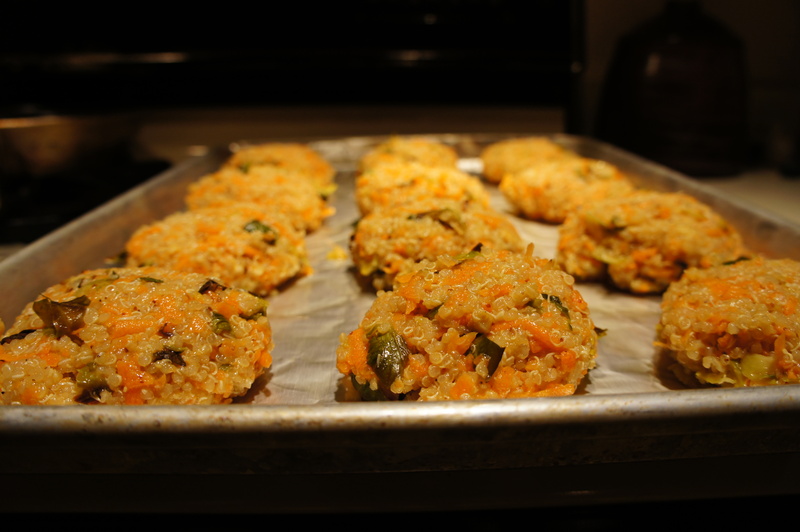 I hope you guys enjoy this variation of quinoa patties. I felt like I needed to come up with one that didn’t require me hovering over sputtering oil, and this was just the ticket. 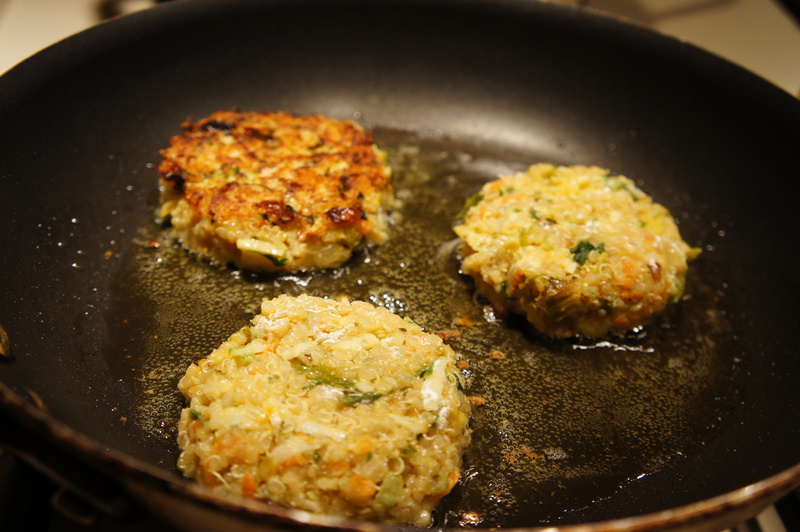 The other day I was trying to convince myself that I did NOT need to eat my 3rd burger of the week… I was losing this self-argument, but in a lightbulb of genius I decided to make quinoa patties. 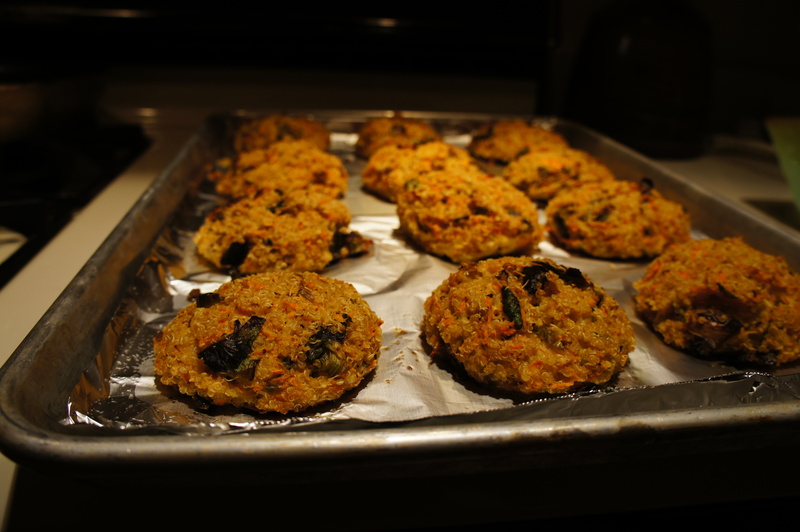 I had been thinking about quinoa and black bean vegetarian patties for a few days, so I thought it only natural to use what I had in the house already. 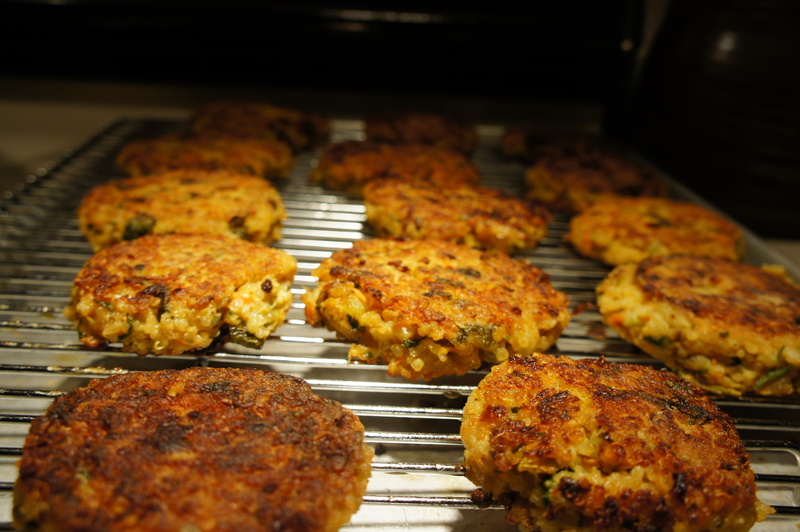 I pulled inspiration for these “cakes” or “patties” from here and here. Have you read Yummy Supper before? Excellent pictures, excellent inspiration, and the name is so adorable!! The other blog is a new find, and I’m excited to read more from it! Wash the quinoa and drain well (I find that unless you give the grains a good scrub you end up with a little sandiness so I’m sure to wash them really well and drain in a mesh sieve). 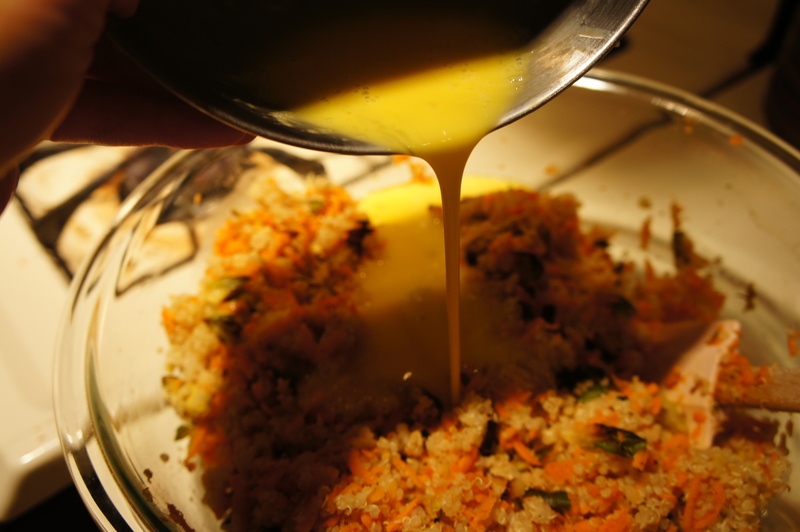 In a saucepan, bring the quinoa to a boil in 2 cups of water. Once the water boils, lower to a simmer and put a lid on it (bahaha… put a lid on it). And let it cook until fluffy (about 20 minutes). While your quinoa is cooking, get started on the vegetables. Dice the celery and onion. Put into a large mixing bowl. Slice the brussel sprouts. I used pre-roasted brussel sprouts, but you could use frozen ones or whatever other green vegetable you have on hand. Add to the mixing bowl. 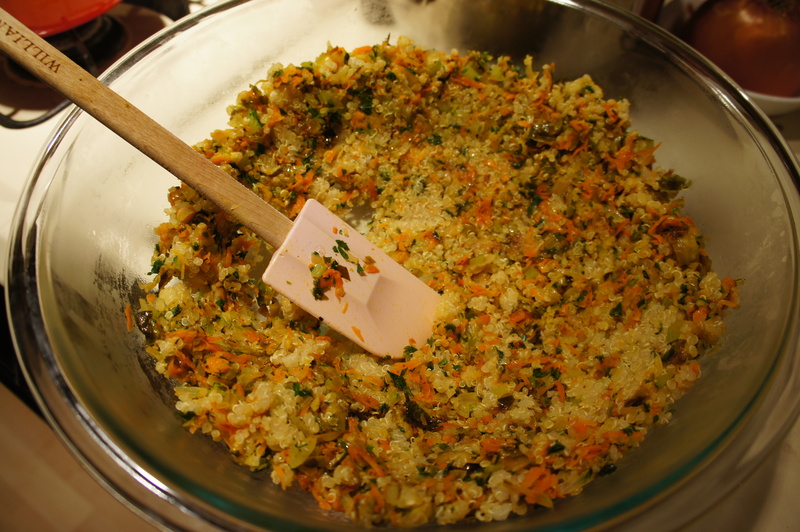 Grate the carrots, using the large holes on your grater, into the mixing bowl with the other vegetables. 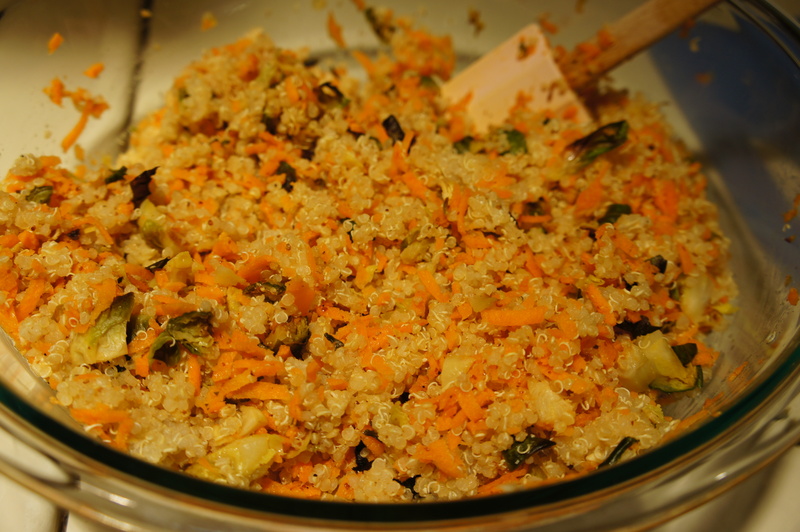 Once your quinoa is done, add to the bowl and stir until evenly incorporated. Add in the whisked eggs, shredded cheese, and salt/pepper. In a frying pan (I used a non-stick one), heat the olive oil until a little bit of batter sizzles. Taste the little sample batter and adjust your seasonings accordingly. Fry the cakes in small batches, allowing them to brown before flipping them. I cooked mine for about 4 minutes on each side. I let them drain on a cookie cooling rack. 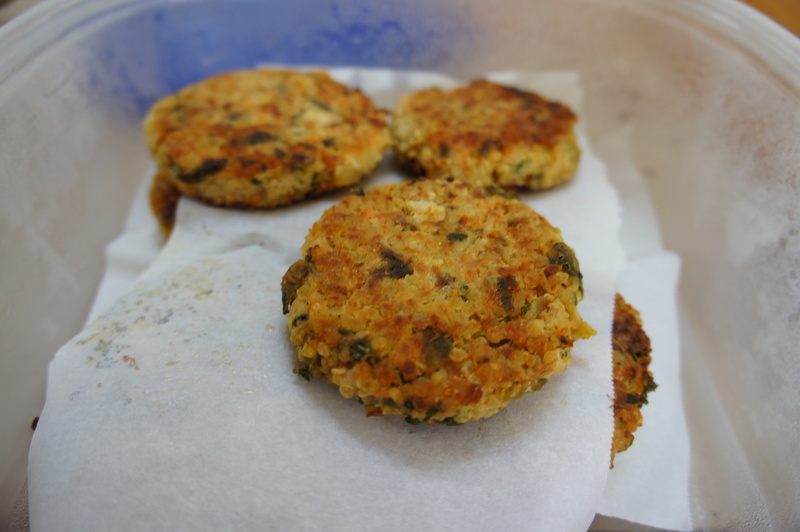 I ate my quinoa cakes with seared scallops and packed the rest of the cakes in a large container with pieces of parchment paper in between layers. To reheat, I simply put them in a frying pan and reheated for a few minutes with a teaspoon of olive oil. These keep well in the fridge for up to a week, but I doubt they will last that long. Let me know if you have any other questions! I think my recipe might be a little garbled, but I made these in a frantic and starved state (and I’m writing it in the middle of the night)! !